A single piece of artistic work can be perceived as literal opposites of the spectrum – where one viewer may see a symbol of death, another may see a new beginning, a symbol of birth and life. There is a lot of duality in this regard, and although the spectrum is literally endless in volume, the Japanese artist Usugrow takes it head on and portrays some of its elements in his work – life and death, black and white, visual and audio. 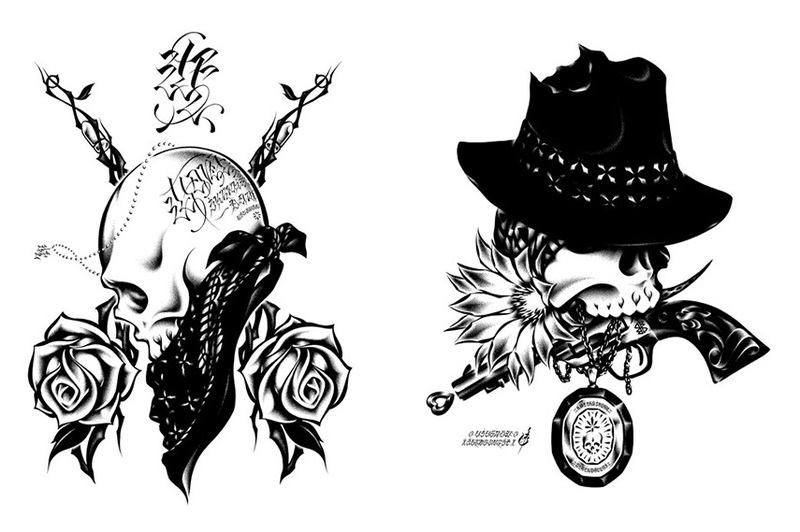 With the skull being a repeating motif able to encompass these oppositions, he draws it, along with other subjects, with great attention to details reminding of a tattoo artist. The delicate oppositions in his works didn’t quite start as such, per se. 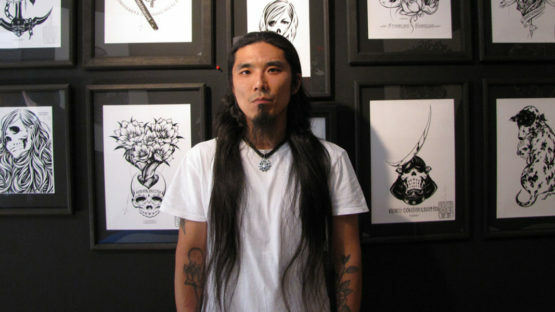 During the early 1990s, the artist known as Usugrow began his artistic practice by making flyers, and when he would draw a skull it was, as he states, “Because it looked cool.” Although a few things have changed since back then, his expression still contains the same motifs: a skull, a flower, and the black and white portrayal of it. He loves drawing the skull and he thinks it holds a lot of meaning; the motif fits his philosophy well, and luckily for him, its depiction was a welcomed sight in the punk rock music business of the 1990s. Usugrow drew a number of designs for various album covers (which he still does) and even widened his field of work to skateboard companies and fashion brands. Usugrow makes his drawings with an incredible attention to detail, using very thin pens in order to emphasize the fine structure of certain parts. With his work being of high quality and sought after, the drawings he would make became a product of their own and he produces them as such today. The skull remaining the central figure, he’s drastically changed the way he sees it, embracing the duality of nature in his practice. 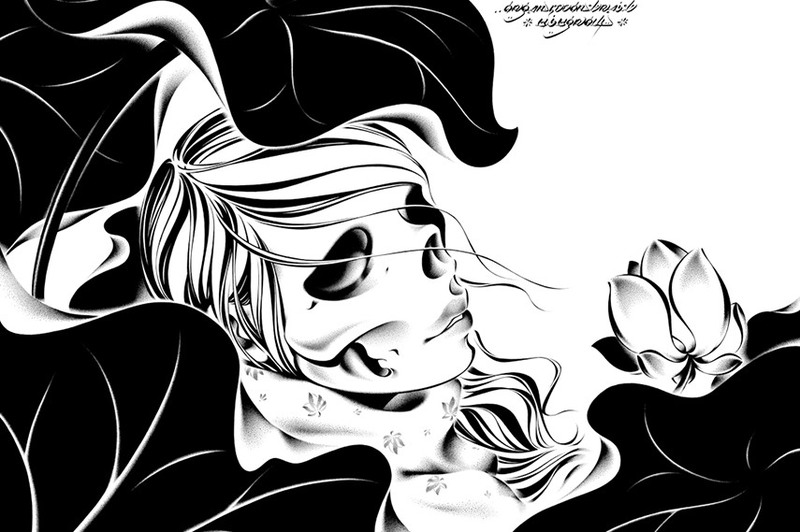 Originally, the skull represents death and anyone seeing it would easily make the same assumption, but Usugrow looks at it as only a part of the whole, reminding that there was life before it came to death. More so, other dualities permeate his work: the black and white portrayal, the loose-hand depictions and letters, even his mantra “Ask the Moon, ask the Sun,” brings together certain opposites. Speaking of how focused he is on the details when he works, Usugrow describes the “noise” that colors like red, blue, and green make, surrounding himself with black in order to remove these distractions. Working on a black table with nothing but a black-colored pen and a white sheet, his undivided attention belongs to the drawing, instilling it with carefully placed details and character. 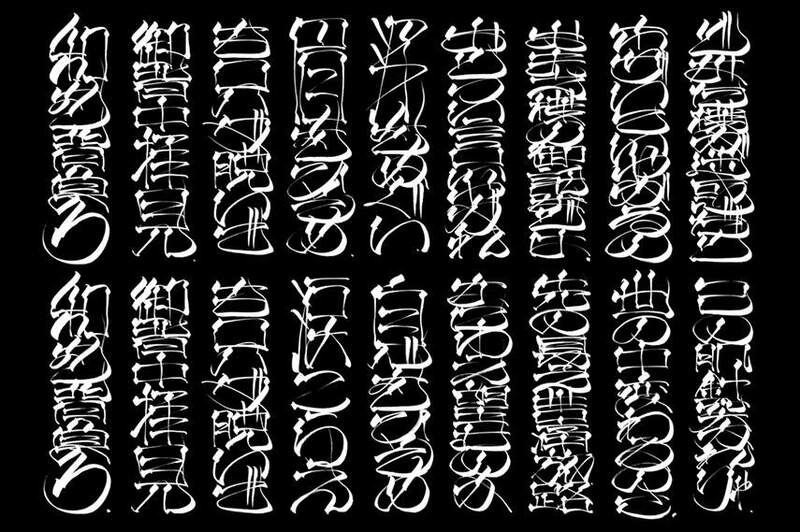 Another element that adds to the personality of the piece and makes it instantly attributable to Usugrow is the unique calligraphy that he’s developed. Naming it Cosmopolitan, Usugrow has merged Chinese characters and other alphabets, adding a spiritual aspect to the composition of his artwork. Remarkably talented, Usugrow manages to bring together the eternally conflicting light and dark, life and death, with such detail that makes the transition between the two seamless. Maintaining his balance, Usugrow sometimes leaves the stability of his desk and performs live painting, believing that both are equally important. By portraying all of these opposites in his creations, Usugrow’s work proves that the different polarities can exist together, making truly remarkable art in the process. The artist is represented by Backwoods Gallery. Usugrow lives and works in Tokyo. Featured image: Usugrow. Photo credits penslingers.com. All other photos credit usugrow.com.